Chess table is one of chess game equipment that has multifunction use. 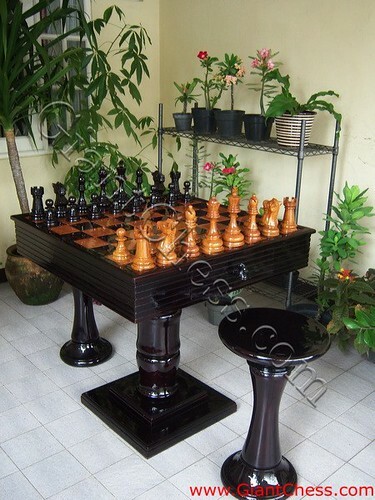 Beside as chess game, you can also use it for house furniture. Placed in your patio, backyard, and veranda, this chess table becomes the center point of your space and best meeting/playing with your family and friends. Complete it with tools or chairs will make it perfect as your antique furniture. Made of high quality of teak, the table is very durable for outdoor use. They are so versatile that you can use them as the regular chess game as well as garden decoration. This table chess has carved by expert crastman and difficult find in another place. You will find the best table that made from solid Teak wood just in our place. Try it!